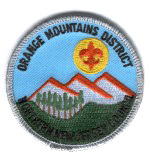 Orange Mountains District recognizes the value of Training for all Scouters and encourages anyone involved in the Scouting movement to seek all available and relevant training. Training provides a Scouter with a solid overview of the Boy Scouts of America's policies and programs on an entire range of subjects. Multiple courses are available and geared towards different leadership functions in Scouting. In Scoutmaster/Assistant Scoutmaster Leader-Specific Training, Scouters focus on the fundamentals and finer techniques of Troop operation, including interaction with youth and the behind-the-scenes work involved in the running of a Troop, such as that completed by the Troop Committee. Another vital element to being a fully trained Scouter is training in Youth Protection. For more information on this, contact the District's Youth Protection Coordinator.